Absolutely beautiful tile! I did it without grout so it wouldn't interrupt the pattern and it came out amazing!! I would highly recommend this product! 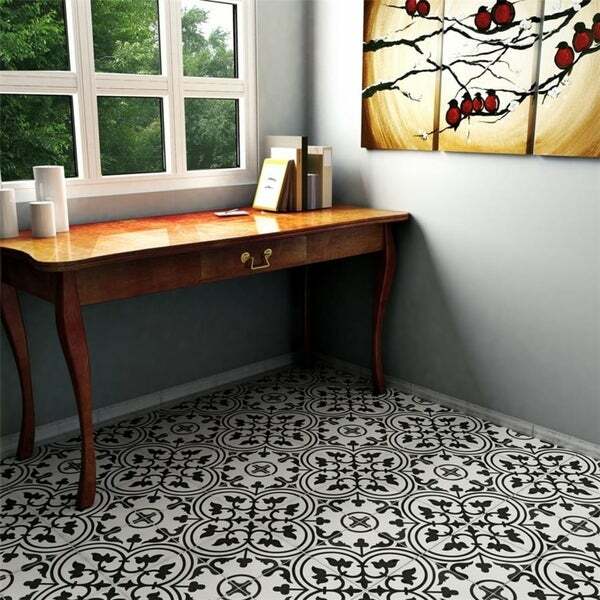 The SomerTile 9.75x9.75-inch Art White Porcelain Floor and Wall Tile features a gorgeous, geometric pattern in a combination of white and warm black hues. Use this low-sheen tile by itself or pair them with many of our other products, including other colors in our Art series. This product is easy to clean and impervious, so you can place it just about anywhere. Dimensions 5.0 In. X 4.5 In. X 0.4 In. 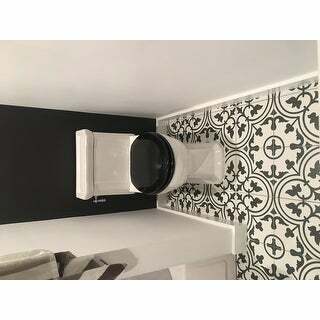 Although this tile is pretty it is definitely not black and white. It is a dark gray and white and the color is quite faded looking compared to the picture. Also the description says it has a "low sheen" which I think is an understatement. It is a completely matte finish which in my experience is rare for tile. I have contacted the company about the return process and it looks like paying the cost of shipping to return it would be more than I paid for it. 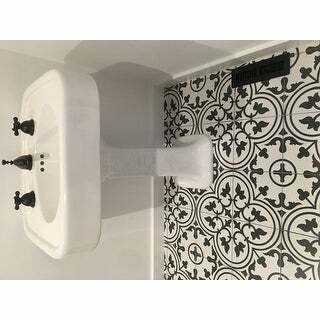 This floor tile is absolutely beautiful in the 11 x 12 farmhouse bathroom that we renovated. Very easy to work with, must use a wet saw to cut the tile. The quality was great, very heavy thick tiles. Out of 14 boxes there was only one tile that had a break in the corner. Packed very well. I would recommend this for anyone who likes the look!! 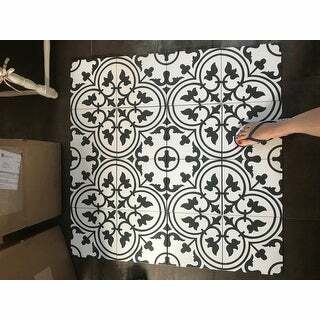 Ordered the sample of this tile. It was TINY. As in 2 inches x 3 inches tiny. This tile might be great, but don’t expect to get any idea of what the tile will look like on your floor from the miniscule sample. 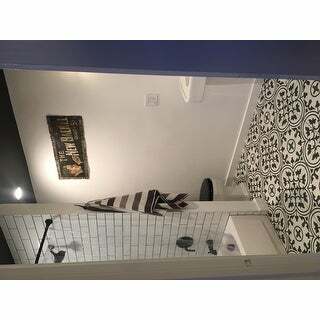 Nice tile. As another reviewer stated, it is not black, it is dark grey. However, once laid on the floor it looks darker than it does coming out of the box. The white is not a bright white, more of a soft warm white. I’m going with a different wall tile because the white tile I was going to use is so much brighter than these tiles. I am happy with them. The tile itself is beautiful. My tile contractor even mentioned that this was a very hard, durable tile and good quality. Be aware of the shipping policies if you're working towards any sort of deadline. If you order more than one case (and let's be real - you'll order more than one case of tile), your item will be shipped via freight and the estimated date of arrival given to you in your shipping confirmation is actually the date of arrival to the freighter company who will then schedule a separate delivery to you. Overstock did not notify me that the tile would be shipped via freighter and that their delivery date was inaccurate. Only when I called to figure out where my missing tile was (with my tile contractor on-site to work), was I notified that items would be shipped via freight. 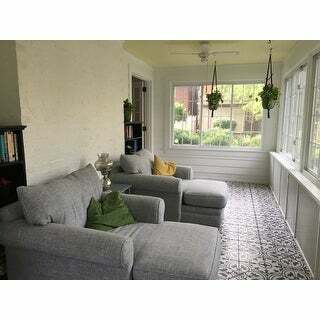 In summary: Beautiful tile, add another week for the freighter company to get you your item from the estimated date of arrival given to you by Overstock. Love this tile! Looked at other similar tile but was cement not porcelain, needed to be sealed & a lot more expensive! Very beautiful and came quickly. Most of all the best customer service I’ve ever experienced! 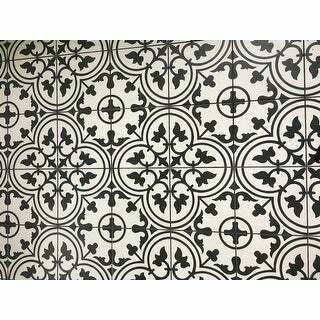 Beautiful floor or wall tile! This is quality product that gives an overall beauty to any space. The price was good and the tiles came well wrapped, and delivery was fast! I would definitely recommend this beautiful tile! We used this tile in our bathroom. It's quite beautiful. It's smooth, but not slippery. We were so pleased with the installation. I would buy it again - anytime! Great purchase. Looks gorgeous in our soon-to-be mudroom. Quality item. Was shipped perfection and looks like cement tiles. The tile may be fine but I ordered a sample to see it and I received a very small rectangle of it! For the price, I was expecting one entire tile. The sample had very little design on it so I didn't get any better idea of what it would look like. I used this tile in my small bathroom and it is just gorgeous. It really is the focus point of the entire room. Buy more than you need - 2 out of the 4 cases were broken upon delivery. Overstock took care of it by sending out the replacements but it took well over a week and I was quite under the gun because work had already begun on my bathroom rehab. Or better yet, open all your boxes when they arrive! I absolutely love this tile. We put this in a small bathroom and it is a statement! I get compliments on this all the time.The black isn't a true black it is slightly lighter. It has been easy to clean as well which was important for me since I looked at cement tiles with a very similar design but didn't clean near as well. This tile is beautiful. It was also shipped VERY responsibly—tightly packaged and all wrapped together on a palette. We used black grout, which looks great. The other thing I would say negative is that the grout can stain little edges if not wiped off very quickly and thoroughly. This floor is absolutely gorgeous. Exactly what I wanted. Designed my bathroom around it. You will not be disappointed. I would highly recommend this tile. Overstock is my favorite place to shop. These are amazing!! So beautiful and love that they are ceramic, but look like Mexican tile (easier to care for). I get why people think they weren't as black as the picture. They look just like the picture, but if you get close to them, they do look like a very dark grey. But who gets that close to a floor?! the price is great too. I went to a local flooring store and they said they couldn't touch that price. Love this tile in our bathroom! Beautiful. I love this tile. Unfortunately this the second time I have ordered it. The first time the installer did it wrong, and now we have to tear it out and get some else to install it. These are soooo beautiful. We think they are going to be amazing in our laundry room and with dray grey or black grout. We will update our review with pictures once finished. These tiles are amazing. The black is more of a charcoal gray, but love the way they look. They make quite the impact statement as our backsplash in the kitchen. Shipping was fast and well packaged! "Can these tiles be used in an outdoor application in Canada where there is freezing and thawing without risk of cracking? Thanks!" Yes, this tile is made of porcelain and is frost resistant, making it possible to use outdoors in freezing conditions provided it is installed correctly. "Do you have this pattern in navy blue?" We currently do not carry this pattern in a navy blue. For a similar look in blue , please see item number 18437664. "Does this tile need to be sealed? Also, is it better to use sanded or unsanded grout with this tile for the floor?" Since this tile is glazed, it is not required to be sealed. If you prefer, you can seal the tile or grout to help prolong the life of the tile. For a floor installation, we would recommend using sanded grout for this tile. "I want to use this tile on my shower walls as well as shower floor. Can I choose matte for the floor to prevent slip and choose shinny for the walls? Thanks"
This tile only comes in a matte finish. You can use this tile on your shower walls and floors as long as the background construction and shower pan are adequately waterproofed, and the installation is done correctly. "What is recommending spacer size for those tiles? What is the spacer size on the photographs?" We recommend a grout width of at least 1/4-inch for this product. 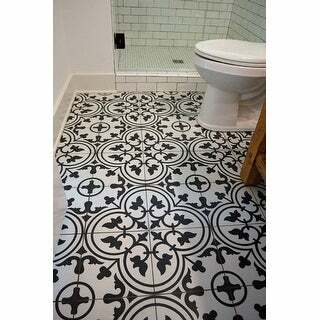 "I have seen this tile pattern in a cement tile. The cement tile is a little thicker but looks the same. 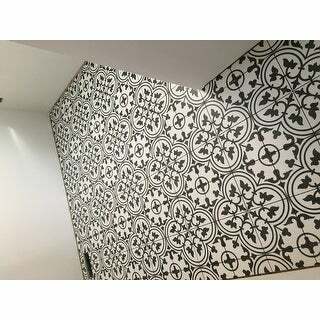 What is the difference between a cement tile and a porcelain tile besides the price"
Cement tiles are handmade and partially through body which is why they are more expensive, but the maintenance can be time consuming as it is recommended to seal the product before and after installing and then at least once a year after installation. Porcelain tiles offer a much more practical version of cement tiles. They are not typically through body, just glazed, but cleaning and maintaining a porcelain tile is much easier. "I adore this tile and would like to use it on the floor of my master bath. I need a 2" or less coordinating tile to use as the floor shower. I plan to use 4 x 12 white subway tile as the shower walls. Any recommendations?" We have many mosaic tile options for your project. A few recommendations we have are Overstock SKUs 14907537, 17611118, and 14306208. Please keep in mind these tiles are not part of the same series, so the white colors may not exactly match the Art White. 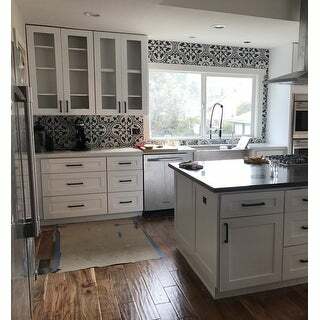 If you would like to view our entire white mosaic collection, we would recommend searching "SomerTile white mosaic" in the Overstock search bar for more options!